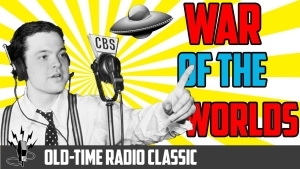 On this day, October 30, 1938, Orson Welles’s infamous radio broadcast of The War of the Worlds first aired. Many people have heard the story of Welles terrifying the nation 77 years ago by accidentally causing them to believe the story of a Martian invasion was actually occurring. But it turns out that most of the well known story is just that, a story. It is told that there was widespread panic, mobs, suicides, and traffic accidents caused by the broadcast. In actuality, there were no spikes in hospital admittances, even from shock or heart attacks; no mobs; no confirmed deaths; and in fact, of the very limited audience, even fewer people truly believed it. There was a noticeable spike in calls to police stations, CBS, and newspapers in attempts to confirm the story, evidence of a group of people who were doubtful at best. Newspapers were actually one of the groups who perpetuated the story of alarm. Believing that advertisers were moving from print to radio, they relished pointing out flaws in the medium, and ran stories of the “great panic” for weeks after everyone discovered the truth. The Chicago Tribune even went as far as outright calling radio listeners stupid for believing the invasion story, and insinuating that newspaper readers were much smarter than that. Orson Welles has also been known to exaggerate the story of his own mess up. When news of his outraged audience first reached him, Welles lamented his career, believing himself to be finished in show business. In reality, it spread the story of his talent, and helped him greatly. Three years later he went on to write, direct, produce, and star in Citizen Kane, often credited as one of the greatest movies ever made. Many radio stations which play old-time programs still air the original show around this time of year as a tradition. So keep your ears open for a Martian invasion story on your local station, and don’t be fooled!